Easy to make, and lets you keep the skin, which assures you’re getting as much of the nutrients as possible. Blend on high for 30 seconds. Chill, then serve. What is the difference between a Vitamix 7500 and a Vitamix Professional Series 300? I am now the owner of a new Vitamix Professional Series 300 ! My company has a rewards program that allowed me to get a Vitamix Professional Series 300, and it was far more interesting to me than any of my other options. Now, I had just recently purchased a Vitamix 7500 , but I called Vitamix and confirmed that they would allow me to return my Vitamix 7500, which means I could get essentially the same blender I bought in October, without spending money on it! Now, before talk about the similarities of the 7500 and Professional Series 300 in any detail, I want to say again how impressed with Vitamix I am. They have seriously impressed me in the past, and returning my Vitamix 7500 was another example of service where I could not have been more impressed. Now, on to talking about the similarities of the Vitamix 7500 and the Professional Series 300. They are, for all practical purposes, the same blender base, container, tamper and lid. The faceplate itself comes in different colors, and the name written on the faceplate is different, but that really is it as far as I can tell. 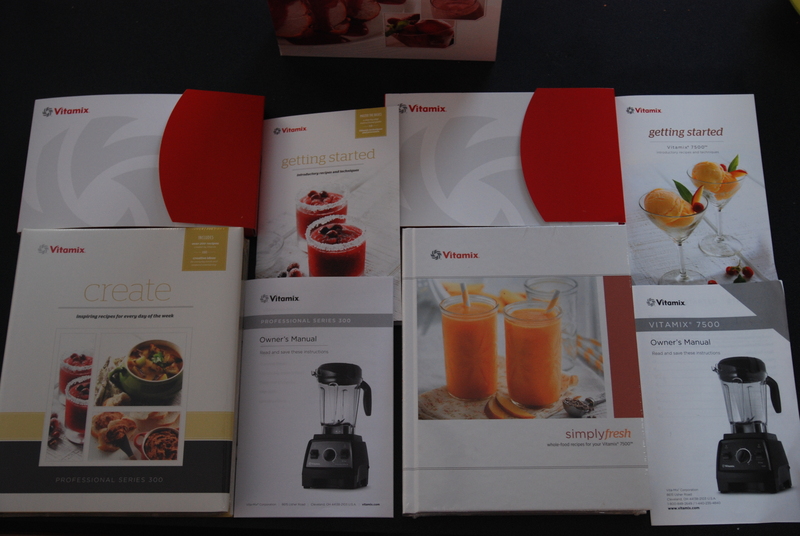 The cookbook, getting started guide and owner’s manual for the Professional Series 300 (left) and Vitamix 7500 (right). 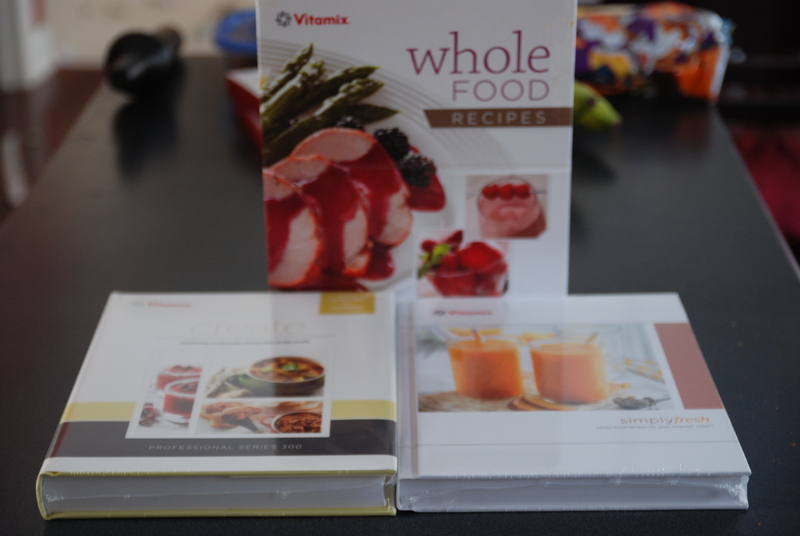 The “create” book that comes with the Professional Series 300 book on the left, the “simply fresh” book that comes with the Vitamix 7500 on the right, with the Whole Food Recipes book the Vitamix 5200 comes with behind them. I hope that’s helpful for anyone who, like me, was wondering what the differences were. My 7500 is in a UPS truck on it’s way back to Vitamix, and aside from the difference in faceplate color, I don’t anticipate noticing any differences with my new Vitamix Professional Series 300. *The price difference is based on the difference in price at Vitamix.com , with the assumption that you’d be ordering from Vitamix.com directly. Vitamix.com is the most affordable way to order a new 7500 that I’ve found, and includes free shipping. This one seemed like it might be a good idea, and the results exceeded my expectations. Freeze small portion of either plain or vanilla yogurt in freezer safe bowls beforehand. Blend frozen yogurt to desired consistency. Add fresh fruits as topping. Enjoy. That’s it. It’s ridiculously simple, and works. Even my two and four-year-old ate a lot of the store brand vanilla yogurt with blackberries on top. Wow! Thank you, everyone, for all the views in 2012! This blog was started in 2011 to try to squeeze as much fun and enjoyment as possible out of a very expensive blender I’d just bought, and I didn’t honestly think I’d still be blogging in 2013. Amazingly, views increased every month from February to December, and more people visited the site in December than I’d had total page views in any two months prior to November! Officially? No. In your store? Maybe. In this post I talk about the above question in detail. I wrote a post about the differences and answering whether or not I think the 7500 is worth the extra money. I’ve also made some videos that include both blenders. I’m not as good at tagging as I should be, but here are all my recipes tagged with five stars. In my experience, everything I can make with the 5200, I can make the same way with the 7500. Vitamix.com . That’s where I bought my refurbished 5200, that’s a great price, and you can read here about Vitamix’s amazing service and support! There was no Black Friday special on the 7500. In 2012 (see the update at the bottom) and years past, Vitamix has put containers or bundles on sale for Black Friday, but if you’re looking for a blender and not a multiple container bundle, there’s no reason to expect a blender special on or around Black Friday in 2013 based on years past. I was pleasantly surprised to find the above link on Vitamix ‘s Vitamix International page. I’ve spent 10 of the last 16 years living in Japan, and didn’t realize Vitamix was available there! Kind of. You can put hot, steamed mochi rice (もち米) in a Vitamix and turn it into mochi, but I don’t recommend it. Clean up is a nightmare, and it’s obviously more stress on the blender than anything else I’ve tried to make. My wife and I make mochi and mame-mochi (餅と豆餅) using an inexpensive Japanese breadmaker that makes amazing mame-mochi, something no blender can do, and I think trying to make mochi from mochi rice in a Vitamix is using the wrong tool for the job. When I spoke with Vitamix by phone, they were offering a $100 trade-in for people who had a 5200 and purchased a 7500. I believe they’re still offering this for 5200 owners. You do have to send your 5200 to them. I chose to give my 5200 to my parents for Christmas instead. 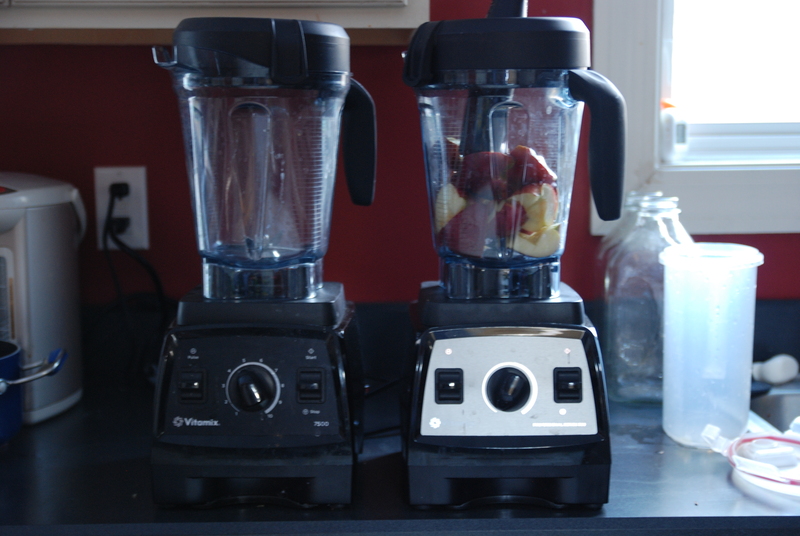 As with my refurbished 5200, I bought my new Vitamix 7500 directly from Vitamix. It was the best price I could find, and their service is as amazing as their product! 06-006651 Both the refurbished 5200 and the refurbished 7500 that I bought, as well as Vitamix’s other blenders, are available with either free shipping at Vitamix.com . Those were the common questions in 2012. A lot of specific recipes on the site came up as well, but hopefully those people were finding the correct pages already. Were there any questions I didn’t answer that you’d like to ask? Let me know in the comments! Thanks again for reading, and I hope 2013 is an even better year!